5th annual cloud accounting conference – Your business and clients are busy, and your competition is growing … September 17-19 Cloud Summit 2014 won’t just help you keep up – it will give you the tools and training to be more efficient, productive and secure! See also: Here Comes Cloud Summit 2014 – Earlybird Discount Ends 5/31! 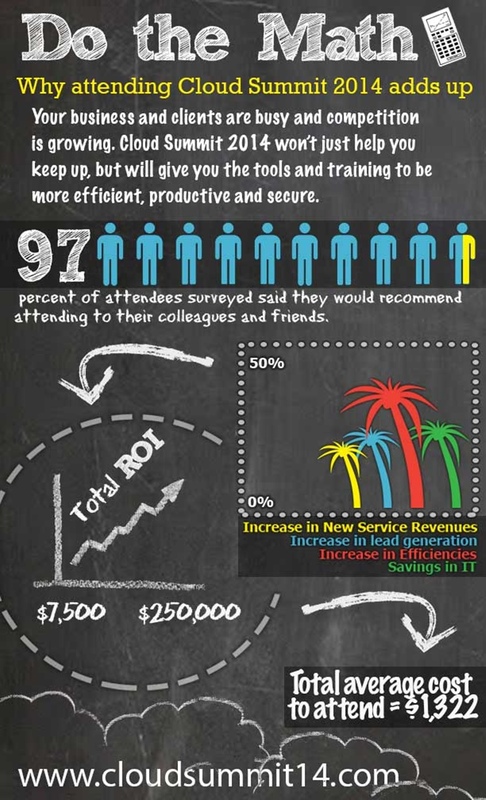 In fact, 97% of attendees surveyed said they would recommend attending the Cloud Summit 2014 cloud accounting conference to their colleagues and friends, and 94% said their business improvements outweighed the cost of attending more than 5-fold. Follow the math below! Cloud Summit ’14 cloud accounting conference combines keynote talks by some of the most influential thought leaders and tech experts in the industry — including Orvel Ray Wilson, Doug Sleeter and Greg LaFollette — with hands-on workshops, 1-on-1 training, educational and marketing sessions and time for networking with other professionals in every stage of implementation.